Cerebos Gregg’s moved from an industrial site in East Tamaki into the historic AEPB building in Newmarket. 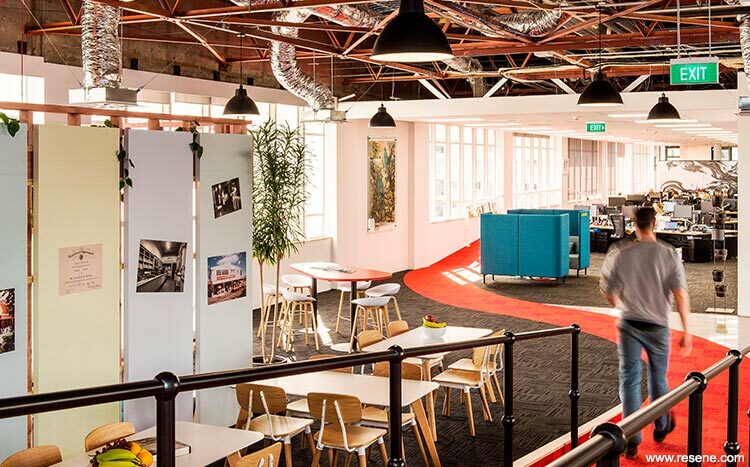 The move is an important cultural shift, enabling the team to be under one roof, and to be 100% open plan. It is also seen as a big advantage having a closer presence to key clients as Cerebos Gregg’s is increasingly moving into the coffee and hospitality arena. The new location is on a split level floor within a long building. This change in level is emphasised by creating a different aesthetic in both areas, with the café space acting as a transition point. ‘Upstairs’ is more functional for the contact centre and finance team. It has extra meeting rooms and acoustic treatment, whereas ‘downstairs’ has larger open collaboration spaces and the café. A long ramp with bright red carpet was constructed to connect the open plan area with the Food and Coffee Studio. This visually breaks up the space and gives the user a more elevated view of the outlook over Nuffield Street. 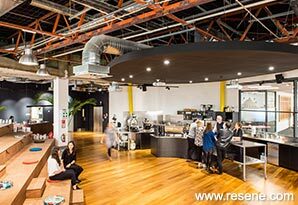 The Food and Coffee Studio is the feature piece of the fitout and is located adjacent to the reception allowing visitors a rare glimpse to ‘behind-the-scenes’ coffee and food preparation .  The Studio exterior is painted a copper colour, using Resene Magma metallic, emulating a large roasting vat. Within the space there is plywood tiered seating, punctuated with colourful seat pads, capable of housing the entire company for large functions and demonstrations. The new building came with heritage constraints that added a rich level of interest to the new fitout. It was a requirement to use an old Kauri operable wall which became a large sliding door to separate a ‘war-room’ space; and Kauri wall panelling became an honours board for the sales team. 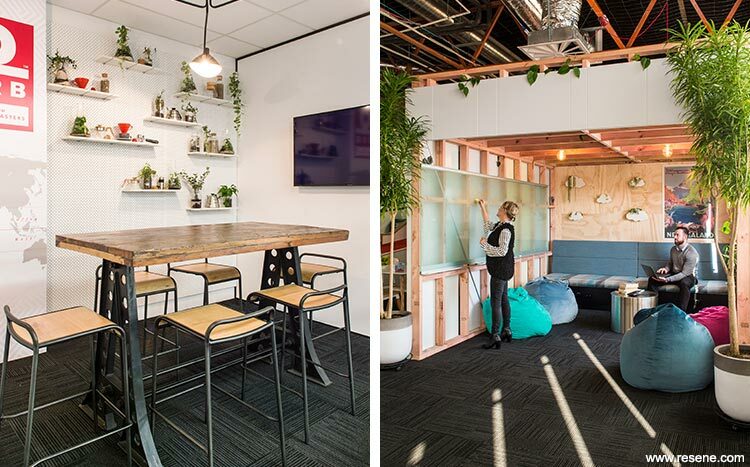 GHD Woodhead Creative Spaces took the challenge one step further and repurposed further materials. Existing office door hardware was installed onto new meeting room doors, and the old doors were used as cladding for the café treehouse. Partition glazing became a whiteboard surface. The raw honesty of the building was exposed by areas of ceiling grid being taken away revealing the existing terracotta coloured roof trusses and large concrete beams. Cerebos Gregg’s was able to salvage timber from their original Dunedin factory and this now clads the Newmarket reception desk. Brand presence was extremely important for Cerebos Gregg’s. Each meeting room was assigned a brand which is reflected in the furniture, lighting and graphics. Custom shelving located outside the boardroom displays food and coffee, and the coffee machines have their own dedicated showroom area adjacent to reception. The use of colours and finishes was used to highlight and complement the heritage of the Nuffield Street building and the history of Cerebos Gregg’s. Using Resene Alabaster in Resene SpaceCote Low Sheen as a neutral backdrop allowed the focus to be drawn to the many heritage items that were reused or exposed, and provided a fresh feel for the bustling activities therein. This also pairs well with doors in Resene Triple Truffle in a Resene Lustacryl semi-gloss finish, feature walls of Resene Double Cod Grey and Resene Triple Concrete and Resene Black as a ceiling feature. The reused Kauri wall panelling was framed with metallic Resene Gold Dust to accentuate the natural timber and spark it back to life. In the reception, Resene Double Cod Grey forms a dark feature wall that retreats from the eye and adds depth and texture to the timber that clads the reception desk, salvaged from the original Cerebos Gregg’s factory in Dunedin. The treehouse is clad with reclaimed doors that have pops of subtle colour, Resene First Light, Resene Carefree, Resene Breeze and Resene Half Breathless in Resene SpaceCote Low Sheen, that are reminiscent of 1950’s pastels, referencing the company history. As the ceiling has been exposed in several parts of the office, the brightness of Resene Starstruck in Resene SpaceCote Low Sheen was used to draw attention to the extract ducts leading upward.